Accident Free Autocheck 3-Owner! Thank you for your interest in one of Arizona Best Cars online offerings. 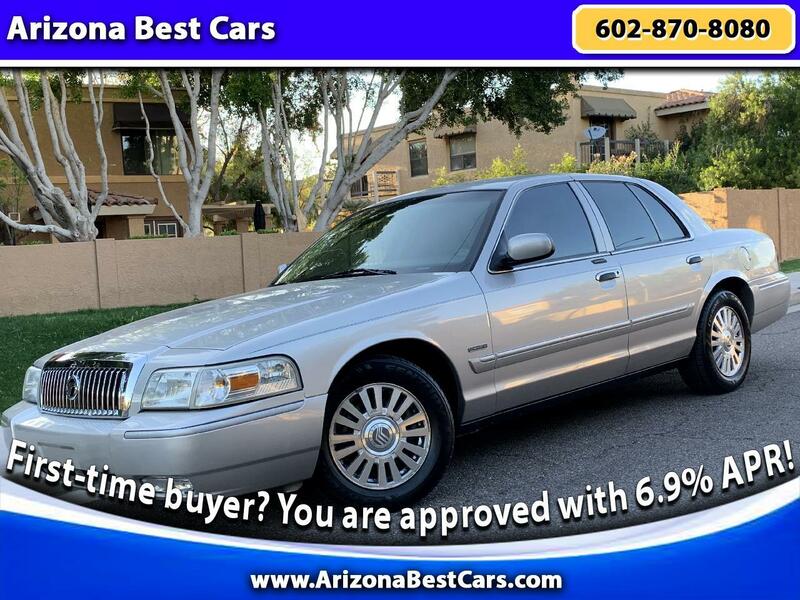 Please continue for more information regarding this Silver Birch Clearcoat Metallic-on-Medium Light Stone Leather 2006 Mercury Grand Marquis LS Ultimate With 114000 Ultra Low Miles. FUEL EFFICIENT 26 MPG Hwy/20 MPG City! Multi-CD Changer, Dual Zone A/C, Alloy Wheels, Overhead Airbag, Its airy cabin is luxurious and inviting. -newCarTestDrive.com. 5 Star Driver Front Crash Rating. CLICK ME!======KEY FEATURES INCLUDE: Leather Heated Memory Seats, Multi-CD Changer, Aluminum Wheels, Dual Zone A/C. Rear Spoiler, Remote Trunk Release, Privacy Glass, Keyless Entry, Steering Wheel Controls. ======EXPERTS REPORT: newCarTestDrive.com explains 2006 Mercury Grand Marquis LSE has been the highest-ranking brand in the J.D. Power and Associates dependability study for more than a decade.. 5 Star Driver Front Crash Rating. 4 Star Passenger Front Crash Rating. Great Gas Mileage: 26 MPG Hwy. Looking for a clean, well-cared for 2006 Mercury Grand Marquis LS Ultimate ? This is it. Rest assured when you purchase a vehicle with the Perfect Car Fax 2-Owner , you're getting what you paid for. Today's luxury vehicle is not just about opulence. It's about a perfect balance of performance, comfort and attention to detail. 2006 Mercury Grand Marquis LS Ultimate is the perfect example of the modern luxury. Simply put, this all wheel drive Lexus is engineered with higher standards. Enjoy improved steering, superior acceleration, and increased stability and safety while driving this 2006 Mercury Grand Marquis LS Ultimate. With only 114000 miles on this Luxury Sedan, you'll appreciate the practically showroom newness of this vehicle. Marked by excellent quality and features with unmistakable refined leather interior that added value and class to the 2006 Mercury Grand Marquis LS Ultimate. Find the quickest driving route in this 2006 Mercury Grand Marquis LS Ultimate . More information about the 2006 Mercury Grand Marquis LS Ultimate : Thanks to its more aggressive styling, the 2006 Mercury Grand Marquis LS Ultimate stands out in its class; Resale value has been impressive on the 2006 Mercury Grand Marquis LS Ultimate. This model sets itself apart with Distinctive styling, roomy interior, ride quality, and high-tech features. Check out our entire inventory of Luxury cars at ArizonaBestCars.com.